I hope I’m not on drugs because THIS IS HYPE!!! 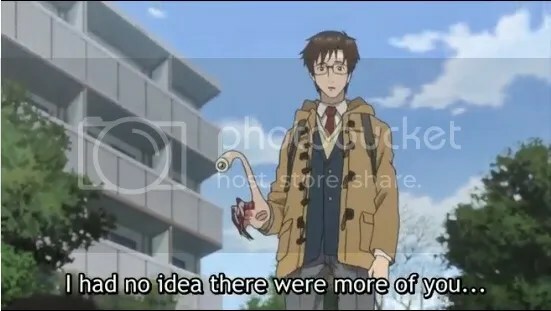 The story is about Shinichi Izumi who loses control of his right hand for some reason and when he finally discovers the reason why he lost control of his right hand, his whole life is changed forever. 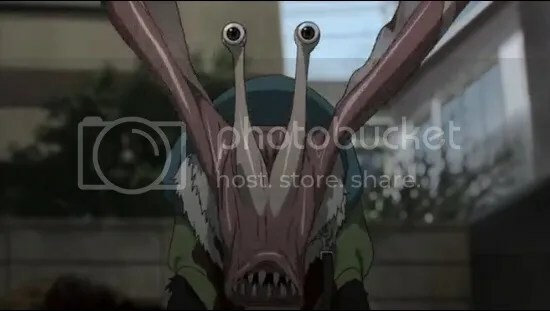 I love my sci-fi stories and Parasyte fits the bill. I’ve read the manga source from way back then and I liked it. To see this first episode was totally hype and it totally delivers. The first anime has blood and gore and I love the dubstep BGM when things get hairy between parasytes. I totally love the OP theme song and sequence but I’m kinda iffy on the ED theme and sequence, but I guess I can let that slide. 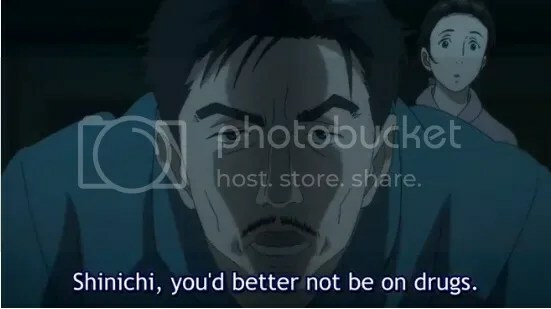 I guess we can expect good seiyuu work from Nobunaga Shimazaki who voices Shinichi and Aya Hirano who voices Shinichi’s parasyte. The anime has got my full attention. First episode was pretty awesome and I hope the next episodes will have the same intensity as the first episode. For sci-fi anime fans, this is a must watch I tell you. So Hirano Aya has landed a role (aside from Lucy from Fairy Tail)? Yes, she did. I think she’ll do good in this anime. After watching the first episode, I think so, too. I think she’s good at voicing non-human characters.